Neither Orthodox theology nor the Orthodox Church is an ideology or a philosophy, but a means of healing. According to the teaching of St Gregory Palamas, theology is theoria, the vision of God. 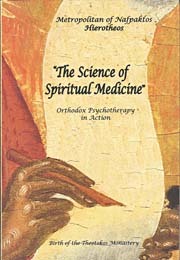 The holy Fathers, as spiritual physicians, indicate and describe a method or healing, a therapeutic method. All the faculties and energies of the soul ought to be referred to Christ and turned towards Him. This therapeutic method is known as hesychasm. It is the basis and end of all Orthodox theology.